Each year the City of Newport Beach in conjunction with the Newport Dunes Waterfront Resort present an amazing fireworks display. It has been Orange County’s most spectacular seaside fireworks display for 50 years. I thought it would be fun to go see the display and capture it with my camera. After looking at the Newport Dunes area via Google Earth, it seemed that one of the best places to view the display would be from the monument area of the Castaways Park. The show was scheduled to begin at 9:00 pm. I arrived at the park at about 7:00 pm to be sure that I would be able to secure a good vantage point for photographing the display. No problem. People did not start to really fill the area until about 8:15. Just before the start of the show, the back bay completely filled with small boats vying for the best position to view the fireworks. The multitude of red and green running lights on the boats added a beautiful background for the show. Below is my photographic record of the show. 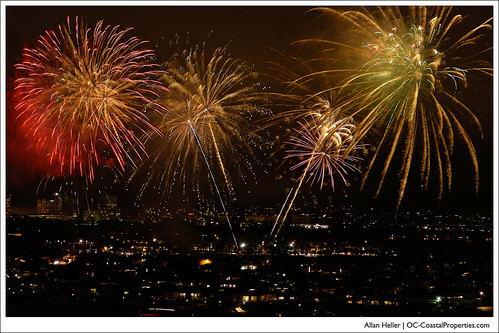 It consists of several images combined to create the same impression as the rapid firing of the fireworks that evening.